HeatSaver® Thermal Shades have been designed with the goal of keeping our shades as thin and attractive as possible while not compromising insulation value or durability. The result is a roman shade configuration that is both familiar and attractive. Simple pull cords raise and lower each panel. For larger shades we also install pulleys to assist with ease of operation. The wide variety of possible window configurations (sizes, shapes, and types) requires that we have a thorough knowledge of options for custom manufacturing and installing your shades. We also have a millwork shop ready to fabricate precisely what is needed. While developing your proposal we will work closely with you on all the pertinent details in order to ensure that your shades are delivered to your specifications and with the quality you expect. 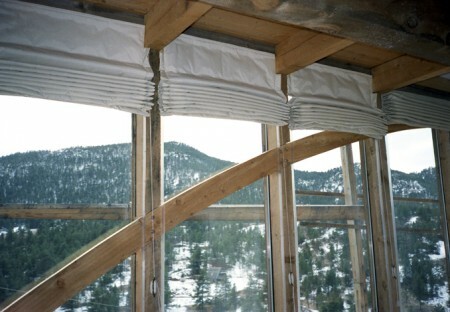 HeatSaver® in a passive solar home, finished with 300 Denier Nylon. quality control guarantees that your shades will operate easily and serve you well for many years! Our ability to customize your order doesn’t begin and end in the workroom. While working with you we will come to understand what your specific needs are and address them with you. Whether custom trim profiles are required, or mockups need to be created, we’ll work with you to find the right solution. “HeatSaver is an American firm that make insulated window blinds from the multi-layer thin insulation sold for roofspaces which looks like the covering of a NASA spaceship. “HeatSaver use(s) a less complex structure in their product, which have the appearance of interlined cream linen roman blinds and the thermal performance of several inches of plastic foam. As HeatSaver® is opaque, your shades will limit both sound and light transmission. Should you prefer to have some diffuse light coming through your lowered shades during the day, we can deliver them without the layer of mylar. This will reduce the insulation value somewhat, but will still give you the warmth and privacy so important to city dwellers. There are five key elements to HeatSaver’s® design and performance. We begin at the core with Thinsulate™. Well known in the sportswear industry, it is thin, durable and has a high degree of insulation with very little bulk. On one side of the Thinsulate™ we add a layer of aluminized mylar. This reflects 97% of long wave heat radiation. Lightweight Polyester is used for lining because it withstands UV radiation and intense sunlight. 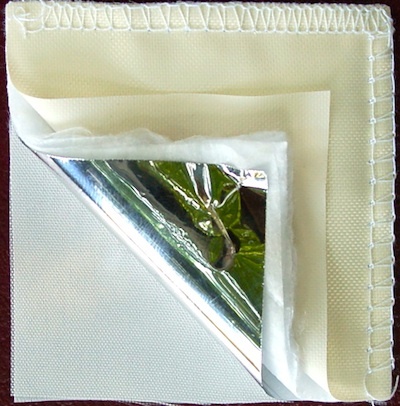 For most applications our 300 denier nylon is quite suitable for finish fabric. It has been treated with a water repellant and cyclic phosphate, a non-toxic flame retardant. 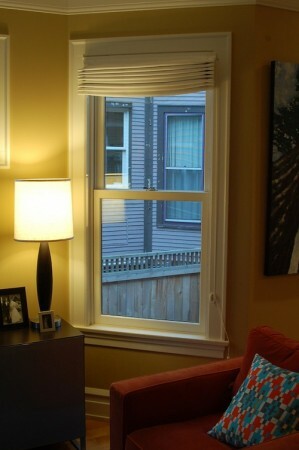 Clear polycarbonate track is installed on either side of the window opening. 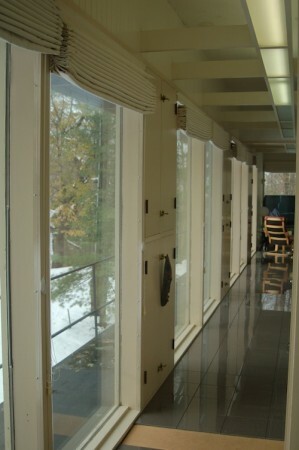 Glides sewn into either side of the shades are inserted into this track, both defining the pleats when the shades have been raised and creating an effective perimeter seal when the shades have been lowered. The track will not “yellow” or become brittle due to extreme temperature swings or UV radiation. Large window treatment companies have to think in terms of mass manufacturing their products. This limits their ability to address the many varied styles and types of window designs that have accumulated over the years. 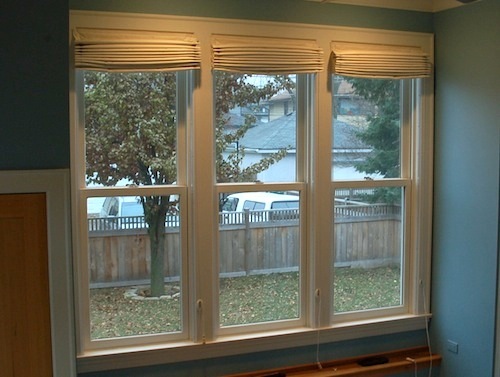 It also requires compromise in adequately addressing all the sources of energy losses related to your windows. 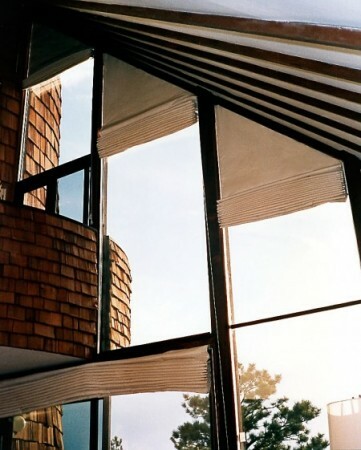 HeatSaver® Thermal Shades have no such restrictions. We’re able to look at each situation and develop solutions that make sense and work for your particular needs. Exceptionally qualified people are crafting your shades by hand, attending to your details. There is no “off the shelf” product configured somehow into an installation that may or may not actually work. When ordering HeatSaver® Thermal Shades you can be fully confident that experienced and knowledgeable people are paying great attention to every facet of your order. It isn’t often that we have the privilege and challenge of manufacturing and installing trapezoid shades over twenty feet off the floor, as we did in this home west of Denver in 1986, but we welcome the opportunity to do so! Successfully completing projects like this is possible only when a disciplined approach to each and every detail is communicated from the client through the sales staff and on to the workroom. Customizing the fit and finish of your shades is what we do best. With HeatSaver® you have the option of selecting your finish fabric. The material should have inherent strength and stability. Keep in mind that your shades will be in place for quite a while, so a neutral background color is a wise choice. We also offer fabrics from Camira. They are milled in the U.K. and operate with the best sustainable practices. We have natural hemp, recycled polyester and pure wool materials for you to choose from. Our Fabrics Page has a few selections you may want to consider. We raised the top of these shades eight inches so the view to the fields beyond would remain unobstructed. It’s fairly common to hear stories of a “cascade of cold air” coming off large window assemblies. This can be especially true with older passive solar windows like the ones above. HeatSaver® solves this problem. Easily. Simply. Effectively. 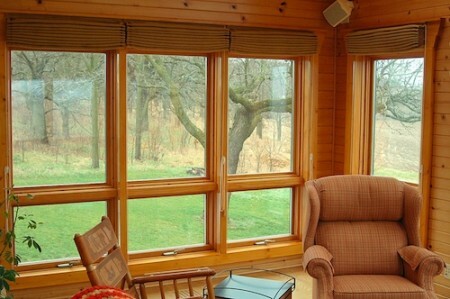 If you’re considering a passive solar design you may want to keep us in mind as including our shades could greatly effect your planning decisions.